Subscribe to the free Hormonology newsletter! You’ll also be the first to find out about new apps, eBooks, videos and other Hormonology tools and live chats. 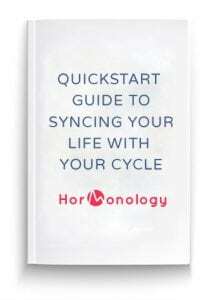 BONUS: Sign up today and I’ll send you my FREE “Hormonology Quickstart Guide to Syncing Your Life with Your Cycle”! This eBook shows you how to immediately start planning your life in sync with your cycle so you can schedule job interviews, dates, project launches, shopping, even your wedding on the best days of your monthly cycle.